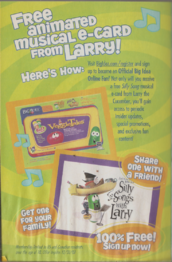 In late 2001, BigIdea released an online-exclusive musical e-card in promotion of their latest VeggieTales release, The Ultimate Silly Song Countdown. 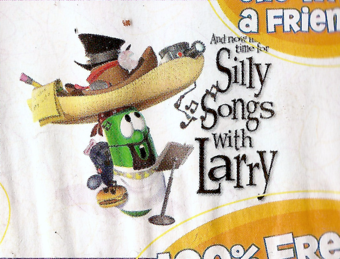 This e-card was based on the popular VeggieTales segment, Silly Songs with Larry, and contained The Pirates Who Don’t Do Anything. There were two ways people could get this e-card; send it to their friends, or sign up to become an official BigIdea online fan. No videos have ever surfaced of this e-card, and the only info found is from an archived version of the official BigIdea website. Official advertisement for the e-card. Title card for the e-card. Official web page for the e-card. Web page that would’ve contained a sample of the e-card.